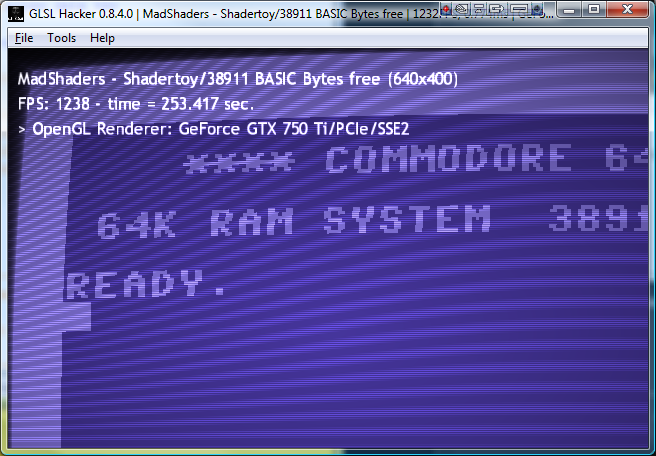 <window name="win3d01" title="MadShaders - Shadertoy/EvilSeed"
The original resolution of the C64 was 320x200, but that looks too crappy nowadays. <window name="win3d01" title="MadShaders - Shadertoy/38911 BASIC Bytes free"
ret = tvWarp(ret / 2.) * 2.;// scale it by 2. // stringIndex lets you use the same pos for a string of chars, just incrementing stringIndex. // this is pretty fast, but is binary. a prettier version might return a distance function but will suffer perf problems because of the complex geometry. element.x = floor(7.0 - element.x);// flip X. maybe my encoding method is wrong? // bounds check; most of the time uv will not land on the character so important to optimize this. gl_FragColor = drawCharacter(gl_FragColor, charColor, uv, stringPos, charSize, 5., 36);// . <window name="win3d01" title="MadShaders - Shadertoy/Magnetismic"
<window name="win3d01" title="MadShaders - Shadertoy/raymarching is so awesome"
<window name="win3d01" title="MadShaders - Shadertoy/MachineRoom"
<window name="win3d01" title="MadShaders - Shadertoy/AncientMars"
// Scene from Karla Quintero's modern dance performance "If Mars"
// Mashup of heavy RMF, Kali's fractal (and stars I believe) and Nimitz's fog trick. // Added IQ's noise for posting on shadertoy. // Apologies for the brute force detail and hence slowness. I changed iResolution a bit. Move mouse to lower right corner if you see only the checker board. <window name="win3d01" title="MadShaders - Shadertoy/Anti menger sphere sponge"
// on how to / do some interesting boolean operations, repetition and displacement. 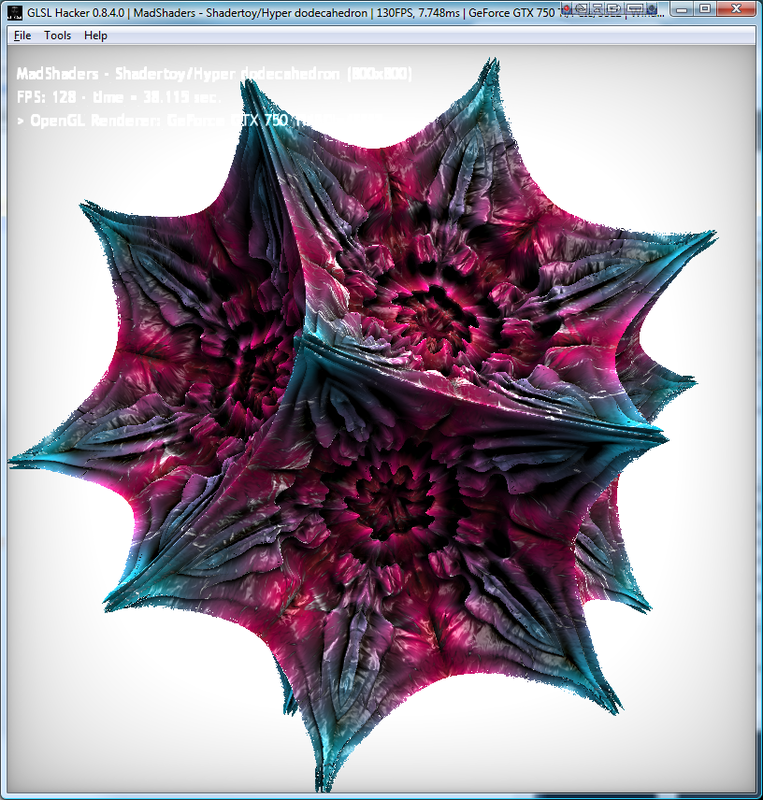 Hyper dodecahedron converted to GLSL Hacker format. Looks best in a square window. 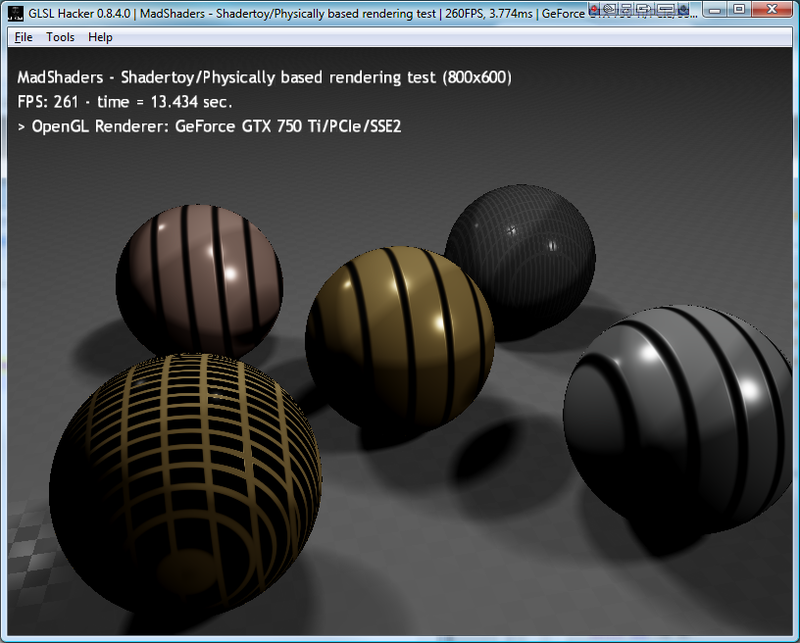 <window name="win3d01" title="MadShaders - Shadertoy/Hyper dodecahedron"
int solidType = 2; // use 0 to 4 for starting shape. <window name="win3d01" title="MadShaders - Shadertoy/Physically based rendering test"
<window name="win3d01" title="MadShaders - Shadertoy/Heartwing Angel"
<window name="win3d01" title="MadShaders - Shadertoy/Manta ray"
<window name="win3d01" title="MadShaders - Shadertoy/Sakura revisited"
<window name="win3d01" title="MadShaders - Shadertoy/Dawn of the tentacle"
Shmup Shader by Katsuomi Kobayashi (@KatsuomiK) [via] converted to GLSL Hacker format. Shmup (Shoot them up) looks best vertikal. Copy the code and save as shmup_gl2.xml in demo folder of MadShaders. <window name="win3d01" title="MadShaders - GLSLSandbox/Shmup Shader"
Descent converted to GLSL Hacker format. Illegal variable name "char" replaced with "hurz". Why is it illegal in GLSL Hacker but not in Shadertoy? Copy the code and save as Descent_gl2.xml in demo folder of MadShaders. <window name="win3d01" title="MadShaders - Shadertoy/Descent"
// illegal variable name "char" replaced with "hurz"
Doom 2 converted to GLSL Hacker format. Copy the code and save as doom_2_gl2.xml in demo folder of MadShaders. <window name="win3d01" title="MadShaders - Shadertoy/Doom 2"
Download the code (too long for this forum) and copy into demo folder of MadShaders. Copy the code and save as CeramicGlassMosaic_gl2.xml in demo folder of MadShaders. <window name="win3d01" title="MadShaders - Shadertoy/CeramicGlassMosaic"
Copy the code and save as Rotating_Structure_gl2.xml in demo folder of MadShaders. <window name="win3d01" title="MadShaders - Shadertoy/Rotating Structure"
Copy the code and save as slisesix_gl2.xml in demo folder of MadShaders. <window name="win3d01" title="MadShaders - GLSLSandbox/Slisesix"
It made 1st position in the Euskal Party 2008 in Bilbao (Spain).